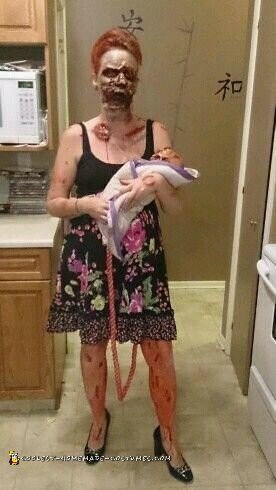 I decided to do a fresh mommy zombie with baby still attached to the umbilical cord, for the baby is it a hand puppet that Ive attached a cord to and freshened her up (her name is Mary) the cord is then attached to my waist and wrapped up through my shorts. For my face the bottom half is Latex and toilet paper about six layers, let each layer dry before you put on the next layer on. Ive then added teeth under the opening that I made with scissors, when putting your desired cuts please be very careful not to cut or poke yourself. The top half of my face is gelatine which you can make by using equal parts of water, gelatine and glyserin. You then put in the microwave for 7 seconds even longer depending on watts of your microwave, use it right away as soon as its not too hot but don’t let it harder or you go through the microwave step again ,the good part of gelatine you can reuse it so if at first you dont succeed try again just heat it again. As soon as it was not to hot I took a spatula a put the desired amount on and where I wanted it while it was hot still I was able to mold it how I wanted. 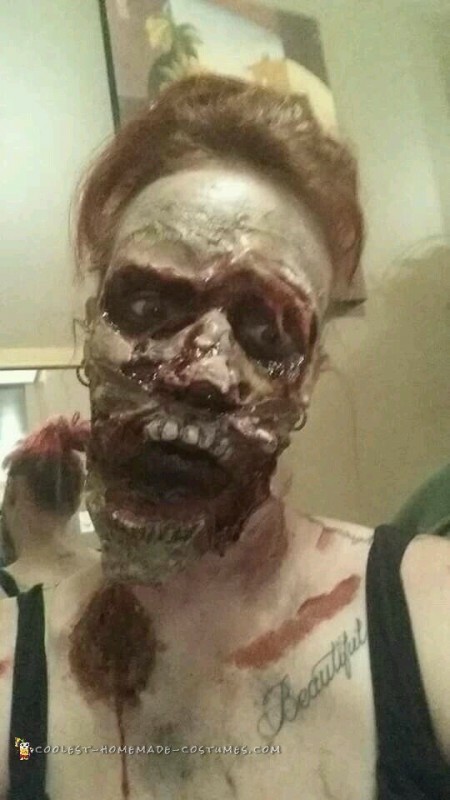 Then I use my paint colors whichever colors you’d like I chose zombie grey and a light foundation with a blood red and pink tones then I went around and made the bruising color and to top it off I put my blood on everything about 4 different kinds. I handed out candy while I was getting ready and scared a few kids and grossed out a few parents. Then I went out and everybody loved it I even have a few photos floating around out there as people we wanting a photo with me or by themselves. In all it took me about 4 hrs to do and I love the final product well worth the time. Homemade costume idea posted by Stephanie W.